Cute baby arrangement to celebrate the birth of the new arrival! This Bassinet basket is filled full with Plush Animal, Teether Key Ring, Baby Bottle, Baby Photo Frame, Baby Blanket, Diapers, Wash Cloths, and "It's A Boy"/It's A Girl" Shortbread Cookies. Wrapped in crisp clear cellophane and topped off with a beautiful handmade bow. Includes a handwritten greeting card. 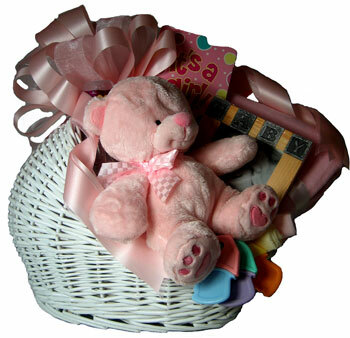 We add silk flowers and ivy for a gorgeous gift basket arrangement. State boy or girl in Special Instructions.